This dramatic and dameur cascade bouquet is one of sheer style and sophistication. 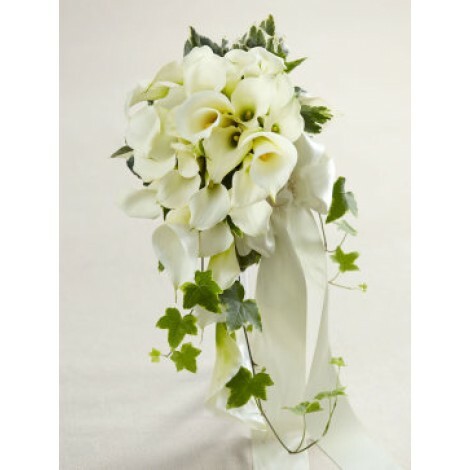 The effortless, natural beauty of this stunning cascade style bouquet is one of undenied elegance and grace. 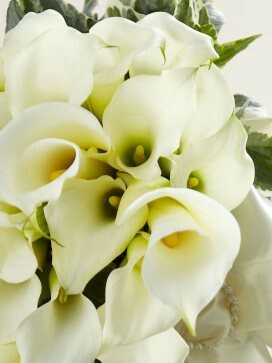 Luscious open cut white calla lilies and mini calla lilies take center stage, accented with delicate and dainty variegated ivy are expertly crafted into this mesmerising cascade masterpiece. Presented in a sugar pearl, circle cascade buckle. 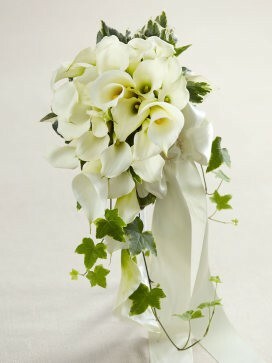 The stems of this bouquet are wrapped in coordinating ivory, satin ribbon. Approximate Dimensions; 22"H x 10"W.